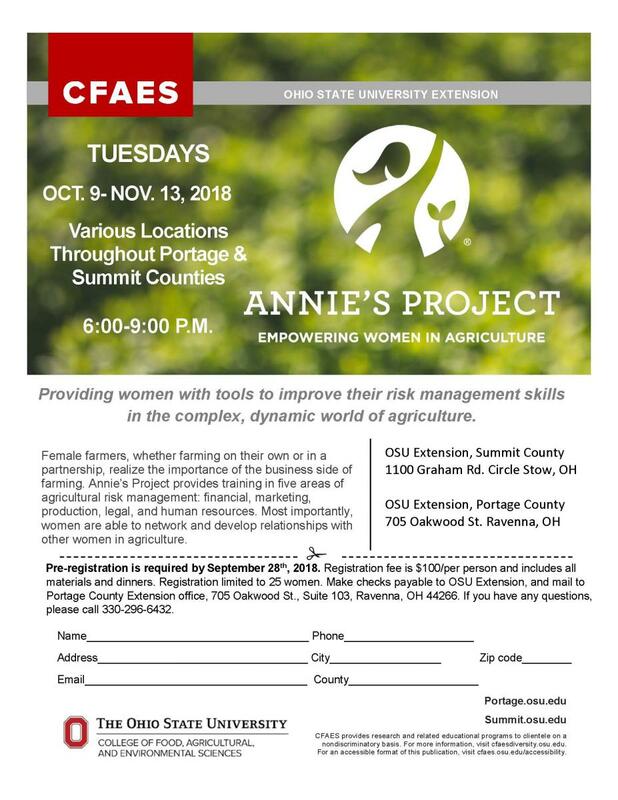 OSU Extension in Summit and Portage Counties are teaming up to offer Annie’s Project from October 9th– November 13th, 2018. Annie’s project is a six-week program designed to address risk management education for farm women. Its objective is to educate women entrepreneurs so that they are more prepared to make farm management decisions. While a large number of farm women own and operate farms, others play a major role in the decision-making process of farm operations for farm families. Annie’s Project provides in-depth sessions on topics that are important for decision-making of the family farm. The program topics covered include human resources, legal risks, financial risks, marketing risks, and production costs and risks. Click here for registration flyer or brochure. Posted by Emily Adams at 6:42pm Posted in Programs and Events. Bookmark the permalink.